Claire woke up with the moon shining on her face. After a night of dancing, she was still dressed in her green gown. Led by the moon, she walked outside barefoot to get a better view of the night sky. Dew was just starting to form on the grass and it caused her feet to make a slight squishing sound. 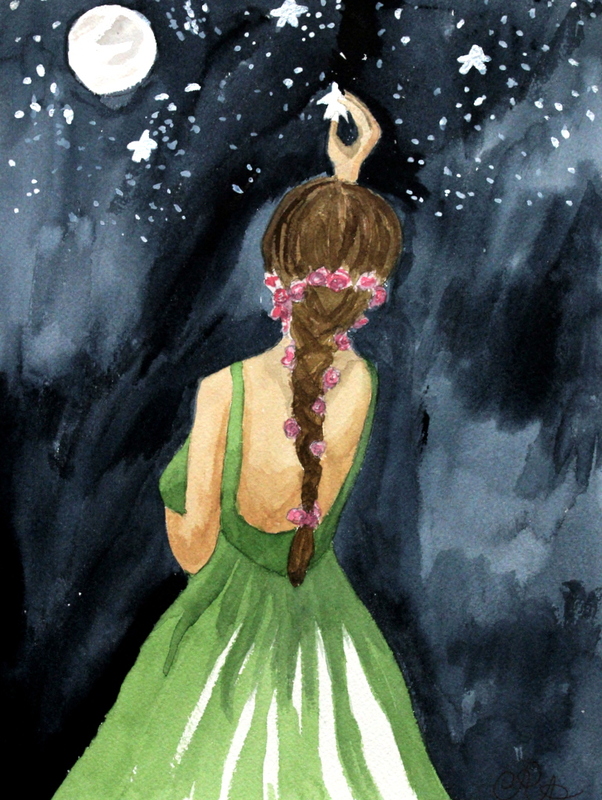 She walked to an open field and started to survey the stars. Claire realized that something did not seem quite right. She closed her eyes and floated toward the stars, letting her intuition guide her to the exact star that needed changing. She realized that this star had been causing the recent bout of clumsiness she had been experiencing in her life. Claire moved it just to the right of the moon so it could benefit from its light and steadiness. Once she finished rearranging the star, she returned to the ground. Claire walked back home and settled into her bed by the window to examine her celestial handiwork. She smiled and fell into a deep sleep knowing that things would be better tomorrow.